Homebuyers do not want to spend their time working on maintenance issues, so composite decks are really gaining traction as a great investment for Severna Park homes. You may desperately want to add a deck to your Severna Park, MD home, but you just can’t commit to the constant maintenance of a wooden deck. What if I told you there was a magical deck that had the aesthetic appeal of wood but required almost no maintenance? That magical material is called TimberTech and is part of the incredible world of composite decking. A wooden deck certainly adds a touch of class to your home. Of course, this classic look comes at a bigger cost than most homeowners are prepared to deal with. Staining, treating, painting and dealing with insect damage are just some of the inevitable issues a wooden deck will face. TimberTech and composite decking solutions offer the visual appeal of wood, but you certainly won’t have to deal with the constant attention that a wooden deck requires. The deck is able to handle whatever Mother Nature has to throw at it, and you won’t feel overwhelmed with treating your deck after each season change. Your home is the biggest investment you will ever make, so you want to make sure that you maintain the value of your home even if you aren’t planning on selling anytime soon. You know the true value of your Severna Park home, but you can help highlight it even further with a TimberTech deck. You can see as high as a 71% return for your composite deck, and a potential homebuyer will love the fact that the deck is virtually maintenance free. Homebuyers do not want to spend their time working on maintenance issues, so composite decks are really gaining traction as a great investment for Severna Park homes. Wooden decks can splinter at certain parts, so that is something to keep in mind if you have younger children. Aside from splinters, wooden decks can become very slippery. Composite decks, on other hand, do not splinter and are very durable. You may not be familiar with composite decking, but contact our team of experts to learn how we can work with you to build the deck of your dreams. 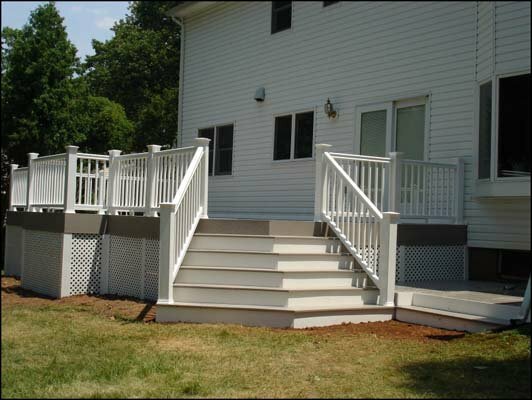 Freedom Fence and Home has lots of experience with decks and fencing, and we are available in the Severna Park area to install a customized deck to suit your needs. You can view our gallery to familiarize yourself with our work. This entry was posted on Friday, June 26th, 2015	at 1:37 pm	. Both comments and pings are currently closed.